In America, he is called Alexander the Great. Alexander Ovechkin is a Russian professional ice hockey player and captain of the Washington Capitals of the National Hockey League. He is a World Champion among youth teams, Champion of Russia, the best rookie player, two-time World Champion, Honored Master of Sports of Russia (2009) … To tell the truth, he has a lot of titles and he deserves them. Alexander was born on September 17, 1985 in Moscow. Tatiana Ovechkina, the mother of the future hockey player, was a legendary basketball player of the USSR national women’s team and Olympic Champion. His father Mikhail is a former professional footballer who played for Moscow Dynamo. His elder brother Sergey also plays hockey. At the age of 8 the little boy was engaged in hockey. Now Ovechkin is one of the best strikers in the modern history of hockey. It is noteworthy that at the age of twelve Ovechkin set an absolute record, scoring 59 goals in the championship of Moscow. Elena Baltacha is a British tennis player. She was a four-time winner of the Aegon Award, a winner of 14 ITF tournaments (10 – singles), Junior Singles Semifinalist at Wimbledon 2001. Pretty girl was born on August 14, 1983 in Kiev, USSR. In 1989 the family moved to the UK. By the way, she is a daughter of two well-known Soviet athletes. Her father Sergei Baltacha played for Kiev Dynamo, Kharkov Metalist and was a member of the USSR national football team. In the United Kingdom he played for Ipswich Town. Her mother Olga represented the USSR in the pentathlon at the Olympics. Elena’s elder brother Sergey followed in their father’s footsteps, playing for Scottish clubs. Baltacha began playing tennis at the age of 6. Hard and grass courts were her favorite. Elena began her professional career in 1997. Maria Sharapova is a Russian professional tennis player, Honored Master of Sports, five-time Grand Slam winner, Olympic silver medalist in London 2012. Pretty girl was born on April 19, 1987 in Nyagan. The family of the future tennis player moved there from Gomel because of the consequences of the Chernobyl disaster. Maria started playing tennis at the age of 4. Yevgeny Kafelnikov (great Russian tennis player) presented little Masha with her first tennis racket. 6-year-old Sharapova (in October 1993) had a chance to play with Martina Navratilova, when she gave tennis lessons in Moscow. Navratilova noticed talented girl and strongly advised her father to send Masha to Nick Bollettieri Tennis Academy, located in Florida. So in 1994, her family moved to Florida. Sharapova’s career started in 2001. ITWA (International Tennis Writers Association) named Maria the best tennis player in 2004. Forbes magazine included her in the list of 100 most influential people in the world and she was the only Russian woman in it. Oksana Grischuk is a Soviet and Russian figure skater who performed in ice dancing together with Evgeni Platov. They are three-time champions of Europe, four-time world champions, the first two-time Olympic champions in ice dancing. Pretty girl was born on March 17, 1972 in Odessa, USSR. Oksana was engaged in figure skating at the age of 4. Valentina Kasyanova was her first coach. In 1981 Oksana moved to Moscow and at first she was a single skater. Alexander Chichkov became her partner in 1985. Having won the Junior World Championship in 1988, the pair was forced to split up in the summer of 1989 because of Alexander’s injury. Oksana was invited to the group of Natalia Dubova, where Evgeni Platov became her partner. Already in December 1989, after only 3 months of joint training, the pair Grishuk – Platov became bronze medalists at the USSR championship, and in 1991 they won the championship of the country. At the 1992 Olympic Games Oksana and Evgeni took the 4th place. In the same year, they won bronze medals at the European and World Championships. In the autumn of 1992 Oksana returned to her former coaches – Linichuk and Karponosov – together with the partner. A year later, the pair won the 1994 Olympics in Lillehammer. Paralympics participants are great persons!!! Each of them deserves medals for the personal achievements. Each of them is a hero. These people will compete in Sochi 2014. Wish them good luck! “I do not regret anything. Even if I could change something in my life, I would not do that. I am who I am, only because it happened to me”- says Irek. 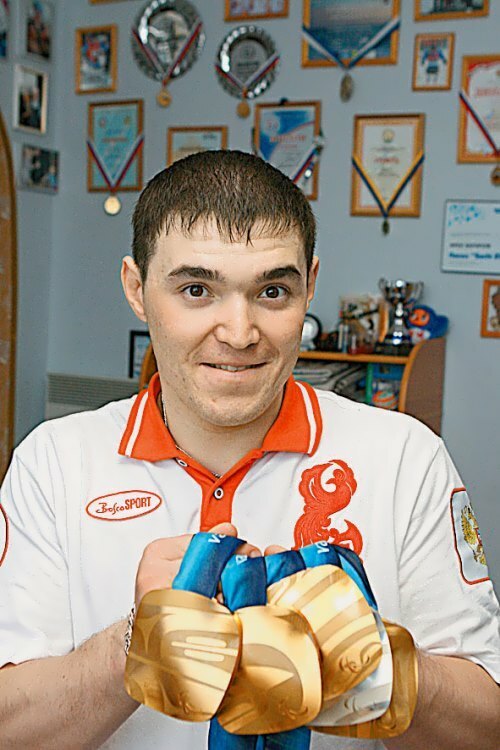 Irek Zaripov is a four-time Paralympic champion.